Some confirmation of Spencer's cloud hypothesis – it is getting less cloudy and warmer at the same time | Watts Up With That? Now, a cause needs to be identified as to why some clouds increase and others decrease. One of the obvious ones to examine is Svensmark’s cosmic ray hypothesis, which says that as solar (magnetic) activity decreases, cosmic ray insolation intensity increases, and cloud cover increases due to more cosmic ray seeding. Aerosols and ENSO may also figure greatly in cloud formation changes. It will be a tough puzzle to fully disentangle given that there have been a number of stations lost that record cloud cover type and the move has been towards automated systems (like ASOS) which only record cloud height and not type. The data in this study is mostly from human observers noting cloud type and height for aviation purposes. Perhaps there will be a way to get this information as the number of observers decrease from satellite image processing. Cloud cover has decreased over the past 39 years globally, and temperatures have risen during that time. This global decrease in cloud cover alone could account for all surface warming observed since the 1970′s. Now, a cause needs to be identified. One of the obvious ones to examine is Svensmark’s cosmic ray hypothesis. Except that as solar activity has generally decreased [hence cosmic ray intensity increased], Svensmark’s hypothesis would predict an increase in cloud cover. So, no need to look there. Interesting. Correct me if I mis-remember, but doesn’t one of the foundations of CAGW suggest that as it warms there will be less cloud and thus less rain? No references, just a hazy recollection. What I think now becomes important is what comes first – less cloud due to natural variation forcing temperature rise; or temperature rise due to the dastardly CO2 forcing less cloud. And at what point do the feedbacks (from either side of the argument) kick in? Let me think what the warming crowd will come up with as the definitive answer ? Everyone knows that it’s the tons of evil CO2 that humans release that is actually crowding out the clouds. Duh! Its reduced anthropogenic aerosol cloud seeding. All we need to do to fix the climate is get rid of pollution controls on motor vehicles and coal fired power stations, and stop trying to put out forest fires. The Greenies aint going to be happy. On a more serious note, I just posted this link on geo-engineering thread, which indicates biomass burning is the main cause of anthropogenic cloud seeding. I would be very careful about drawing conclusions as to the directions of causality here. There have been many observations that warmer temperatures correlate with reduced cloud cover. The mainstream models basically assume that temperatures cause cloud cover changes, and I think Spencer is correct to say that this assumption has not been properly verified. I say this as someone whose academic and professional specialty for the last 30 years has been feedback control systems. As such I am astounded that there has been virtually no attention paid in mainstream climate science as to the direction of causality in this relationship. That said, I don’t see anything here that demonstrates in any conclusive sense that the direction of causality goes that other way — that is, we don’t yet have the information to say that cloud cover changes (of whatever origin) cause temperature changes. This is perfectly consistent with the basics from Leroux. His seminal work from 1993 explains why. His final book was published in 2010. Dynamic Analysis of Weather and Climate, Springer/Praxis, 2nd English Edition. I find it curiously hilarious that Google ads decided to display an ad for Cloud Computing. That particular cloud has definitely been on the increase. Hahaha. With all this science going on you’d think it would be warmer than it is, but I still have spring moss in my grass and summer is winding down in the PNWet. Cooler is the missing news everywhere I look. Sure we had some warm days, but the cooler times have been more frequent. The arctic is warming meaning it is losing heat to space at the greatest rate in recent times, and all the indicators are we are, as a planet, shedding heat to the uncaring blackness of space at unprecedented rates. That heat is coming from the lower latitudes. This can’t be good in the long term. Will there be enough CO2 next year for my sweet corn and red potatoes? Should I plant my watermelons or roast the seeds? Do I put in winter wheat in the spring? Where is the heat going? Tropical cloud cover seems to be increasing and also seems to (inverse) correlate quite well with cosmic ray intensity. Perhaps the author will send some of this ‘less cloudiness’ to the UK for the rest of our ‘summer’. That will make up for the poor overall weather we’ve had so far. Also note the changes in low level clouds versus middle and high level clouds is an order of magnitude greater than the change in total clouds. The former decreasing and the latter increasing. This for me is persuasive that the changes are due to reduced anthropogenic/biomass burning aerosols. The size of the change in South America is interesting. The Amazon basin has the largest forest fires in the world. Studies show a declining trend in biomass burning in S America. Interesting, though, the high altitude clouds being in decline and low altitude increasing, that would mean cooling actually, or at least compensating the overall effect of cloud reduction. Also, it would represent a positive feedback. This will be interesting to follow. The climate4you site shows the same thing with the satellite obs of cloud cover. Approximately a 4% decrease centred around the mid 90s prior to the jump in global temps. Everyone has missed the obvious boom and bust in stratospheric water vapour caused by the mt Pinatubo eruption that continues to this day (effectively multidecadal volcanic warming) . SO2 from eruptions combines with H2O before being rained out leaving the stratosphere H2O diminished. This results in stratospheric Cooling and probably alters the meridional/zonal patterns in weather via the polar vortexes. I also suspect that if Solar has a climate effect it would be through a similar mechanism with the UV/ozone system. A also wonder if solar climate changes are related to the change in solar energy rather than the level. Increase in activity (unstable spring weather in stratosphere) =cooling. Decreases in activity (stable fall weather) =warming. This would help explain such paradoxes as the large solar cycle in the 70s corresponding with a period of global cooling. In another thread Leif produced evidence for the changes in cloud quantities at different levels which appeared to show that high and medium clouds decreased until around 2000 but have been increasing since. Perhaps he should reproduce it here again. The most likely reason for changing cloud amounts globally is not the Svensmark hypothesis but the changing jetstream behaviour towards increasing zonality with less clouds up to about 2000 then increasing meridionalityafter 2000 with more clouds. I note that this paper refers to cloudiness overland only but that is only 30% of the Earth’s surface and heavily influenced by topography. The topographical influences may well be obscuring the detail of the global trends. The declines in total cloud cover seen at middle latitudes and the increases in the Arctic agree with recent predictions by global climate models given greenhouse warming. A sustained decrease in global cloud cover MUST cause an increase in surface warming. Dr Spencer apparently calculates that a 1-2% decrease would result in a warming trend of about 0.8°C/century. If there have been other contributing factors in the past 40 years, they must have balanced out. That begs the question whether this cloud decrease could have been driven (in some mysterious way) by greenhouse gases. If not, the IPCC will need to re-write its drafts for next year’s assessment report. Interesting that the largest increase in sunshine has occurred in Oceania. I know Pinker stated their Pinker et al 2005 paper (cited in AR4) should not be construed as meaning less clouds were allowing more sunlight to reach the earth, but isn’t this paper effectively saying something similar? What was that about cloud- producing ships, again? If temperature rises, relative humidity drops and you get less clouds. So what comes first, higher temperatures or less clouds? Judging from NASA’s Spaceweather.com sunspot numbers so far this month, we are due for a downtick on their graph of monthly sunspot number progression. Not that that short-term variation is significant in itself, but I would have thought that Svensmark’s hypothesis could have been easily tested by plotting such short term variations in solar activity against satellite observations of global cloud cover over a similar time period and looking for any correlation. In fact it’s such an obvious test of his hypothesis that I must have missed reporting either of this having been done or an impediment to such a test. No, the expectation was imperceptibly more rain overall, but increased rainfall poleward of 50°N and monsoonal regions. The slight overall increase in rainfall corresponds to the ~0.1% decrease in specific enthalpy of water on evaporation per 1°C of temperature rise. It would also be interesting to see how cloudiness has changed by latitudinal band eg tropic, temperate etc. and timing through the day. Willis might find support for his thermostat hypothesis, or not. We have had more rain in Australia and flooding in 2010, 2011 and still some now. Particularly in winter that generally is are driest period. But what he says rings true. If solar activity slows, more galactic rays get through, however, they are only one part of the equation, ocean currents and volcanoes, can change the temperature also. The hotter is becomes, the more evaporation, more clouds. Move 50 miles away from the sea and precipitation levels drop naturally. Look at Australia and our shape. And of course in the USA you have deserts right in the middle of your continent, yet people have lived there at one time. I don’t know what all these climate change alarmists have been going on about all these years, but to scare the uneducated and poor in the world, that western richer countries are causing economic and agricultural downfalls and should pay for their faulty handling of their natural and human environment. Cumulonimbus are more common in warmer weather. Wouldn’t a temperature increase be expected to cause them to increase ? Other cloud types are more likely to be effected by the Svensmark effect. “Insolation” comes from the sun (our sun). Cosmic rays come from (notionally) exploded suns. This research, Dr Spencer’s work and the general increase in climate studies all reveal an important fact. That the climate is far too complex to be covered by by just one hypothesis. Regardless of what Hansen and the other IPCC supported scientists say. Keep up the good work. Have you ever been outside on a sunny day, then had clouds cover the sun? What happens? Before judging whether clouds have cooled or warmed the planet one needs to consider the effects they will have on all relevant parts of the electromagnetic spectrum. Less clouds should mean less incoming short wave radiation, which people have jumped on here, but less clouds should also mean more outgoing longwave radiation. Until someone performs the relevant radiative transfer calculations it is premature to be saying anything about whether this supports Roy Spencer’s cloud hypothesis. That is what is being stressed at the outset of a CERN lecture on their cloud chamber experiments as well (Iposted the link so many times that I now grew tired pulling it up yet again). If clouds have a substantial effect either way, then of course even slight changes cannot be neglected or ignored, and knowing about them is crucial in determining their effect. In a related talk, they also say that as physicists, they have grave concerns with what boldness and conviction climate scientists throw their assertions around, where a physicist can only wonder what they are rooted in… and they bemoan the fact that research related to the cloud experiment has been rejected by one emminent science journal, in their view solely based on agenda…. there you go. It will be the physicists after all who’ll save the world – maybe. Except that as solar activity has generally decreased [hence cosmic ray intensity increased], Svensmark’s hypothesis would predict an increase in cloud cover. Is there necessarily such a linear, positively correlated relationship? It appears more likely to me that there would be a “sweet spot” where you would maximize the cloud cover for a given intensity, but it would fall off to either side. Sort of like ringing a bell – if you’re not hitting it at the fundamental resonant frequency, it won’t be nearly as loud. Could it not be that, with increased rays, the clouds will rain out too frequently, and be unable to gain large mass before they are induced to rain out again, thus producing a negative correlation between cosmic ray intensity and cloud cover? Leo G @ August 21, 2012 at 12:13 am mentions an increase in rainfall over the same period…? As this is based on observations is there any Time of Observation adjustment that is, or should be made? so what about global dimming? If it`s getting less cloudy, we should get more solar radiation- which is not the case. If the concentration of one atmospheric constituent goes UP, the concentration of other constituents MUST come down (basic maths). The more sthings change the more they stay the same. Clouds are formed from water vapour. That comes from surface evapouration caused by heat. The higher the heat the more evapouration and cloud especially Cb cloud, due to the energetic cells, forming especially in the tropics. At least that is how I see it which does not quite fit with Dr Spencer. This will keep the scientists engaged for a while but the politicians will dismiss it out of hand. Having come up with various schemes to tax carbon they’re not going to shut that gold mine down, especially as taxing cosmic rays and solar magnetic activity will entail sending the bill to God . . . and he ain’t payin’. That first graph is useless and the exclusion of data suggests that the actual (non-excluded data) may not be representative of the conclusion. AKA Latin America; an small area where almost all the land in less than 200 miles from an ocean, is all tropical and much if not most of the large area long duration cloudy periods are tropical storm related. In short the first graph smells of cherries. but without the condensation nucleii, it doesn’t form cloud. Cosmic rays bombarding the atmosphere create some of these nucleii. to see how it all works..
Hmmm. So what they are saying, is that to reduce Global Warming, we need more aircraft flying and creating contrails. So what the Greens need to campaign for, is the ending of taxes on air travel, and a government subsidy of ticket prices. This is not only good for the environment, it is also good for people who want to travel. Do you think Greenpeace will be campaigning for more air travel soon? Pigs may fly before more aircraft do…. Clouds certainly do affect temperatures and the effect of increased clouds is cooler daily temperatures. The night time effect is affected by daytime clouds, but is generally warming. One source of confusion is that in some places, like NW Europe, warmer air masses cause clouds. So people think clouds cause warmer temperatures. Here is a paper by our friend Trenberth that covers the subject. Some places are getting more cloudy, other places are getting less cloudy. Some places are getting warmer, others are getting colder. It’s called weather. Wake me up when EVERY AREA is doing the same thing at the same time. 2. The lower humidity leads to lower enthalpy of the atmosphere so less energy is needed to raise the atmospheric temperature. So the same amount of energy will result in higher atmospheric temperatures. These two changes will lead to a whole slew of interacting effects some of which will feed back. There may be other effects such as cloud seeding by neutrons, but if the amount of water in the atmosphere available to form cloud is reduced that effect will be reduced. Slight changes in the energy distribution in the atmosphere will change the relative strengths of the convective Hadley and Ferrel cells altering the paths of the jet streams. As Stephen Wilde points out if the Rossby waves happen to interact with say the Himalayas or just run over the central plains there will be subtly or hugely different effects. REPLY: I know you would like to dismiss Svensmark out of hand, and I should have been clearer. There are some indications in the paper that certain types of clouds have in fact been on the increase while others are on the decrease. Solar science is similar to watching a really, really slow NASCAR race. Each lap of the Sun is about 30 days, plus or minus depending where you may be on the surface. Pit stops are a decade apart. Harken back to the days of the Indy 500 and the turbine engines of Andy Granatelli in ’67 and ’68. James Garner (the actor who drove the things) told Johnny Carson they had very slow response time and were just plain dangerous. A 1, 2 or 3+ second delay from when you changed the throttle to when you the car responded. The Sun is a great deal like the Granatelli cars – there’s delays in response to changes. If one compares the cumulative volume effect of solar output for the last few pit stops, one might conclude ther is a cumulative effect as the solar wind volume would tend to increase – i.e., it’s sphere gets bigger. The solar wind has decreased but there’s still a lot of stuff the Sun produced in the last few years that we’ve yet to move away from since we’ve not left the old outputs behind. Think in terms of the old Chrsyler Fluid Drive which prevented stalling. One hopes Leif is right. I’d really like to grow tomatoes for another couple of pit stops. Could there be a correlation between the amount and type of air travel and aircraft movements and the formation and height of clouds.As more efficient aircraft come into service and the GFC and internet slows the number of flights, could fewer ionised particles formed in jet exhausts reduce the seeding of clouds? Can anyone give me a clear quotation from the original Eastman & Warren 2012 (EW2012) paper where it is stated that changes in cloudcover has caused global warming? It looks like the authors conclude the opposite: It is climate change which causes cloudcover and cloud properties to change/evolve and not what is being speculated here. So in fact what EW2012 are saying is that cloudcover changes are a feedback of climate warming. Dr. Spencer is claiming the opposite of what Eastman & Warren are saying. Who is right and who is wrong is the big question? Conclusion: The title of this blog does not live up to the content of the paper. The paper is no confirmation of Spencer’s cloud hypothesis at all. For that you need to present the correlation between temperature and cloudcover and also proof what changed first Temperature or Cloudcover. According to EW2012 it was increase in temperature that changed cloud properties and not the other way around. This finding jibes well with the work on sunshine hours and the strong correlation between them and temperature change. That is correct but global cloudiness (and albedo) does not seem to be strongly linked to Cb cloud amounts in the tropics. To find the reason for global changes we need to look at a global influence. One possibility would be global temperature (such as from more CO2) but there seems to be doubt as to whether a higher global temperature gives more clouds (more evaporation and condensation) or less clouds (the air able to carry more water in vapour form). Furthermore our contribution was too small to account for pre 1945 climate changes ( the IPCC concedes that) and there were many of those of a comparable scale to those of the late 20th century. Another would be internal ocean cycling but that seems to be relatively short term and would not give the long rise in temperature from LIA to date nor the long fall in temperatures from MWP to LIA. Yet another (the most likely in my view) would be the matter of solar effects acting via the polar vortices from the top down so as to change jetstream positioning and / or the degree of jetstream meridionality as compared to zonality.That would change global cloudiness and albedo without any need to invoke Svensmark’s ideas. To make a decision we need to sort out cause and effect. In the late 20th century did the temperature rise first to widen the tropical air masses, push the jets poleward and thereby reduce cloudiness or did the polar vortices change first to reduce the size of the polar air masses and allow the jets to shift poleward ? To get the temperature to rise first is a problem if the rise in temperature requires more solar input to the oceans to cause that temperature rise. That extra input to the oceans cannot occur unless the clouds reduce first. So I think it has to be the solar top down effect that caused the reduced cloudiness and then the change in energy input to the oceans increased to cause warming. The test is whether, as I think to be the case, the reverse process has been in train since around 2000. Evidence is accumulating to that effect. In the UK, Met Office graphs show a similarity in patterns between temperature and sunshine hours. There may be other effects such as cloud seeding by neutrons, but if the amount of water in the atmosphere available to form cloud is reduced that effect will be reduced. shows that Water content has been dropping too. It looks like the whole climate picture is still to cloudy to draw any conclusions. But seriously, I can only offer a simple observation from a golfer. There is always a general concern here in Florida at this time of year that the afternoon will bring thunderstorms due to daytime heating. Not good to out on the golf course then. However, I have noticed that when there are cirrus clouds visible in the AM, the PM thunderstorms are less likely to develop, so we plan out golf accordingly. This has to tie in somehow with Bob Tisdale’s compelling demonstration of ENSO’s role in most or all of the warming over the last half century. So my bet would be on an ENSO link. A key operative parameter must be the ITCZ (inter tropical converence zone) i.e. the width of the conspicuous band of cloud around the earth’s equator – Stephen Wilde any comments on this? South America looks the worst to me. That’s what chopping down rain forests does for you. IIRC, Svensmark has always been clear that he is talking about lowlevel maritime stratus forming in air cleared of condensation nuclei by rain upstream. E.g. the eastern Pacific. Cosmic rays and dimethyl sulfide gas from decaying algae combine, many steps later, to create nuclei in supersaturated air. The regions of the planet affected are neither large nor well defined on that graph. I haven’t weighed through the paper yet, but the title includes “from Land Stations” so this may not be a relevant paper. Svensmark has always been clear that he was talking about low-level clouds OVER THE OCEANS and this study says absolutely nothing about that. Reduced clouds due to reduced aerosol-nuclei, which consequently reduce the building of droplets in the atmosphere and, hence, reduce the global cloud-cover overall? IMHO, It would be interesting to superimpose the availlability of droplet-inducing nuclei and the development of cloud-cover and see, if there’s perhaps a causation involved. It is obvious that CO2 is causing a decrease in cloud cover…. Cedarhill said — Harken back to the days of the Indy 500 and the turbine engines of Andy Granatelli in ’67 and ’68. James Garner (the actor who drove the things) told Johnny Carson they had very slow response time and were just plain dangerous. A 1, 2 or 3+ second delay from when you changed the throttle to when you the car responded. Sorry Cedar, but in the interest of history, we must note that it was Parnelli Jones who drove the turbine cars…and came within 10 miles of winning before they were banned forever. Thanks Leif, that was my point. You can have as many cloud condensation nucleii as you want – but if there is insufficient water vapor for the air to be saturated or supersaturated then they will have minimal effect. I think that we need to avoid falling into the ‘global average’ traps too. The amount of water vapor in the air varies considerably. Look at http://www.ssd.noaa.gov/goes/east/natl/flash-wv.html and see the swirls of dry air and (at the moment) the convective storms along the ITCZ. If the dry air with little cloud is held by blocking of the Rossby waves and is over ocean, the ocean will warm and vice versa it may cool. An archive of land-based, surface-observed cloud reports has been updated and now spans 39 years from 1971 through 2009. So this only represents continental area, not ocean area. Furthermore, Antarctica seems to be excluded. Since data for 3/4 of the world is missing, it is very difficult to extrapolate this ~1.6% change over land to predict the global change. So they have switched data sources, switched techniques, and switched the number of stations over the course of their studies. I could easily imagine that such changes alone could lead to a percent or two change in calculated cloud cover (and how do you observationally tell the difference between 51% cloud cover and 52% cloud cover, anyway?). Declining clouds in middle latitudes at high and middle levels appear responsible for this trend. Aren’t LOW clouds suppose to cool the earth, but high clouds warm it? So declining HIGH clouds (as seen in this report) would COOL the earth, not warm it. * Most of the change seems to be in one continent – South America. That in itself is odd. What is special about South America? * Why are US & Canada excluded from recent North America data? They would have the best data AND cover nearly the entire continent. * Where have all the skeptics gone??? There are so many questions to be answered, yet any report that supports the desired conclusion seems to be given a free pass on skepticism. Interesting. As Rob JM and others have pointed out, there is much data on Climate4you that bears this out. I mull over the climate4you data here: http://greenerblog.blogspot.co.uk/2011/09/cloud-cover-decreases-in-warming-planet.html. It is clear from the data that cloud cover is inversely proportional to global temperature. The essence of the problem lies in the direction of causality. Do increased clouds cause global cooling, or does global warming cause less cloud cover? Or is it a bit of both? I could find no perceptible lag between the cloud and temperature traces that would give a clue as to causality. Simple physics teaches us that less cloud is to be expected in a warmer atmosphere. The data on climate4you also shows that high altitude cloud, which has a warming effect, increases in a warming atmosphere, and that the low altitude cloud, which has a cooling effect, decreases in a warming atmosphere. This suggests that the net effect on cloud in a warming world will be to have a positive feedback effect, (which is in keeping with Dessler’s findings) but that this effect, fortunately, will diminish with progressive warming. “Warmer atmosphere” – or warmer conditions as measured at the surface of a sphere at the center of the atmosphere (which is assumed to be ~ 70% liquid covered)? Yes. The ITCZ is a key operative parameter as per Willis Eschenbach’s Thermostat Hypothesis. But it needs to be extended globally. When the tropical air masses expand at a time of active sun due to the polar air masses shrinking the extra solar energy into the oceans energises the ITCZ but the extra upward flow has to come down again which helps to enlarge and extend the subtropical high pressure cells as they expand poleward to take advantage of the contraction of the polar air masses. As regards ENSO the additional energy into the oceans also increases the power of El Nino events as compared to La Nina events which gives upward temperature stepping from one positive PDO phase to the next as per Bob Tisdale’s findings. We would see upward stepping every 60 years or so whilst the sun is getting more active such as from LIA to date and downward stepping every 60 years or so from MWP to LIA. Is that the right way round ? Leif, do you wish to retract your claim that a paper regarding cloudiness over land can be used to critique Svensmark? If one ignores CO2 as a signifcant influence one has to find a means of warming the system before the clouds reduce if warming is to be the cause.We can ignore CO2 for the moment because this has all happened before and we want to know the natural mechanism before we put CO2 in its place. TSI changes are insufficient so ignore that too. Warming has to be caused by more solar energy getting into the oceans so the clouds must reduce first. The sun must cause a change in the global air circulation that reduces clouds when the sun is more active. Hence latitudinally shifting jets with increased zonality and wider tropical air masses at a time of active sun. If anyone has another way of warming the system without the clouds reducing first then let’s hear it. Possibly that was sarcasm but I’ll treat it seriously. CO2 is still increasing but since around 2000 there has been an increase in high and medium clouds and total global albedo. well, Mr. Watts introduced Svensmark to the topic, Leif just replied, didn’t he? From another thread Leif thinks that CO2 doesn’t warm the troposphere much but that it does cool the stratosphere (along with CFCs) and that therefore the poleward shifting jets were due to CO2 and CFCs. That enables him to deal with the now equatorward shifting jets by saying that the reduction of CFCs is offsetting the continuing effect on the stratosphere of more CO2 whilst remaining a sceptic as far as the effect of CO2 on the troposphere is concerned. Unfortunately that does not explain the cyclical shifting of the jets fom MWP to LIA to date. I think he is wrong, that the sun is the primary culprit and that the effects of CFCs and CO2 on both stratosphere and troposphere are minute compared to the natural solar induced changes. If I have misunderstood then no doubt Leif will clarify. well said. we know what is happening, don’t we? 2) by measuring the speed of warming against time (acceleration) I figured that the maximum input of energy into earth occured in 1995. From those results, it also looked that the warming cycle had started some 50 years before 1995. For Eurasia it was also going down from 1971 but it looks like flat from 1995. 4) there appears to be a 100 year weather cycle causing 50 years of cooling followed by 50 years of warming that coincides with solar activity. It must be due to the interaction of UV and oxygen in the upper atmosphere and the formation of ozone. I share your conclusion but have a slight problem with some of your timings. Nonetheless this is not a precise science as yet and the ENSO signal does interfere with the solar signal. If global warming is not producing additional atmospheric moisture as one of the cardinal feedbacks predicts what does this say about the models? Dang ! All these years I was sure that I got colder, when a cloud went between me and the sun, so I was in a shadow zone; but I never carried a thermometer around to prove it was colder. Just think; I could have published my seat of the pants observations in some peer reviewed journal, and nipped all this costly controversy in the bud. Well as they say; You snooze, you lose ! Right on Dr Roy; you pegged it. (It appears, maybe just possibly consistent with the new observations. So from the first graph, North America cloud is going nowhere, but Canada and USA is going south cloudwise, so what else is in North America, that must be having a big increase in cloud ? Well I suppose it must be Mexico. I did once describe here at WUWT actually watching clouds form and grow out of nothing over the Baja Peninsula, adjacent to the Sea of Cortez, while I was out fishing. See, another missed research grant opportunity; but it must be true; Mexico is all clouding up. As I recall, I even explained just how I thought it all worked; but noted I am NOT a meteorologist, so Anthony probably got a good laugh out of my silly idea. I should do more fishing, and take a thermometer with me, plus my fisheye all sky lens. I think it is better to measure cloud cover from UNDER the cover where it counts, than looking from the top; and the fishing is better underneath as well. The Nyquist problem is somewhat formidable when measuring clouds; but nobody in climatism pays any attention to sampled data theory anyhow; see for example, the Yamal Charlie Brown Christmas Tree fiasco. Maybe I got that Canada/USA thing backwards. Mexico is getting uncloudy, while the USA/Canada cloud is filling in for their lack of cloud. This happens all the time, it is called Confirmation bias. My claim was that the paper under discussion does not support Svensmark. Do you think otherwise [see my reply to Tim]? And the data I linked to is the global cover which you may recall is mostly ocean. You still don’t get it. The stratosphere responds to the jets, not the other way around. Perhaps Svensmark needs to rethink his theory. Is it possible that more cosmic rays would speed up the velocity of the water cycle and mean that more compact precipitation zones (less overall cloudiness) would serve to maintain the heat balance? Please remember there are lots of cosmic rays that originate from the sun. The galactic cosmic ray flux is a subset of all cosmic rays. The atmosphere is indiscriminate. If we have learnt anything at all it is that the “one hypothesis” paradigm, with respect to climate, is a million miles away from the truth. The notion that CO2 is THE preponderant cause of climate changes ought never to have been entertained in the first place. We are still feeling our way when t comes to an even half decent understanding of the Earth’s climate. Interesting. Correct me if I mis-remember, but doesn’t one of the foundations of CAGW suggest that as it warms there will be less cloud and thus less rain? Thankyou Andrew. Decreased cloud cover could be what the climate clowns call “positive feedback.” Score that round to the warmist corner. What about looking at aerosol coverage and create a mask of areas that usually have types that would compete with aerosols produced frame the proposed cosmic rays effect. Then look at changes in albedo. -Yes it is. The graph is confusing, because it places the low level cloud (blue) above the high level cloud (red). Stephen Wilde says: We can ignore CO2 for the moment because this has all happened before. – This is not a safe argument in a multi-factorial system. It is like saying, “I had a cough for 6 weeks when I was a non-smoking child, therefore my present cough has nothing to do with the fact that I now smoke”. “It looks like the authors conclude the opposite: It is climate change which causes cloudcover and cloud properties to change/evolve and not what is being speculated here. So in fact what EW2012 are saying is that cloudcover changes are a feedback of climate warming. Well I think it would be correct to remember that the core claim for ‘scary warming’ from CO2 is positive feedbacks attributed in models to H2O vapour increasing in the absolute sense – increasing specific humidity because of a drop in relative humudity caused by CO2 forcing. Is this not so? Is this not the reason for the claim that doubling of CO2 will lead to +3 Deg C in global temperature? I believe it is because it has been cited very many times and is in the IPCC reports. So let’s look at the facts: the global temperature rose significantly from 1976 to 1995 or 98 depending on who you ask, but not since then. The specific humidity declined during that time and the cloud cover also decreased (it could hardly increase with less water vapour available). to change in a warming climate. Well they have changed, but it has not been because of increasing specific humidity, and that is the core reason for a claim for water feedback effects from a CO2-warmed world, isn’t it? Am I missing something here? Where is the positive feedback that results in an increased the specific humidity? The specific humidity has dropped with rising CO2, not increased! There seems to be no positive CO2, water vapour feedback, temperature rise at all. It looks neutral or negative no matter which way you slice it. Since 1995, the specific humidity dropped with basically no change in temperature. The CO2 level is much higher with no change in temperature, and a forecast specific humidity ‘feedback’ rise that has not materialised. It seems to me the postulation of a CO2-forced H2O ‘feedback law’ is abrogated. >Changes are likely to be seen in cloud amount, height, thickness, geographical distribution, and morphology. Well, that’s easy to say isn’t it? But is does not address the core of the theory at all. Or Vice Versa, driven by the positive or negative AMO and PDO. Which is the effect? Which the cause? There is a body of thought that says the jet stream paths are highly (significantly) affected by solar events, or lack thereof. At least the solar effects correlate with the observations. Unless some additional H2O vapour can be located in the atmosphere in an world with increasing CO2, with or without a temperature change, the ‘positive feedback’ conjecture is invalidated. As there is an equally valid and physics-based claim for negative feedbacks, and as the evidence supports it, one can confidently say there can be no empirically-based consensus that CO2 induces a positive specific humidity feedback effect nor a positive feedback temperature increase resulting from a CO2-induced increase in atmospheric water vapour content. Because it just ain’t so. Stephen Wilde says: “Warming has to be caused by more solar energy getting into the oceans so the clouds must reduce first. The sun must cause a change in the global air circulation that reduces clouds when the sun is more active. Hence latitudinally shifting jets with increased zonality and wider tropical air masses at a time of active sun”. – To be clear, you are supposing that when the sun is more active, jets streams will shift towards the poles, and/or clouds cover will consequently be reduced. This is a testable hypothesis, since there should be a positive correlation between solar activity and cloud cover. Datasets on both of these must be available, possibly on climate4you. Please remember there are lots of cosmic rays that originate from the sun. The galactic cosmic ray flux is a subset of all cosmic rays. Actually not, and certainly not of the energy [above 10 GeV] that Svensmark claims are needed for his theory. A temperature rise comes first, but produces higher clouds, in particular higher amounts of mid level clouds but lower amounts of low level clouds. Clearly a negative feedback as the higher the cloud is, the colder it is, and the less it can potentially warm the surface, or keep the surface warmer. Is there anyone out there who knows where I can download data of monthly cloud cover over different regions which also include last year? The reason I’m asking is because over the last months I have experimented with an Artificial Neural Network software I’ve written in which I look for correlations in climate data. I’m especially interested in finding climate correlations in relation to cosmic data. That is solar wind data, galactic cosmic ray data and correlations to magnetic variations. The data I’m using is data that are available and downloadable on the Internet. I’ve looked at correlations to the global temperature from satellites and from GISS. I’ve written about the global temperature data from satellite data HERE. The result I got was surprising to me, because what I found was that there were high correlations between the solar wind indexes and the global temperature from the satellite. In fact too high! What I now think is that this result is as a result from an artifact in the satellite recording. It can be from variations in the satellites drag, from contamination caused by variations in the ionization on the upper atmosphere or the variations in the number of protons from cosmic rays could also affect the detector in some way. Right now I’m doing runs looking for correlations to the ENSO index. There are two reasons for doing this. One is that I’m interested to find out correlations of forcing factors to the climate. The other is as an engineering interest as I use the neural network to search for correlations on a chaotic non linear system in which the different factors are intercorrelated in a complex fashion. In such a system it is difficult to find out the underling factors by using FFT analysis or by utilizing regression analysis, simply because there are too many underlining factors and time lags. My belief is that by using Neural Networks in the way I have used by looking for statistical correlations, it is possible to overcome many of these constrains when one is dealing with complex intercorrelated chaotic non linear systems. I think that correlations calculated from Neural Networks in engineering and physics is under-used. Please note that the step-like change in atmospheric water content 1998-1999 may be related to changes in the analysis procedure used for producing the data set, according to information from ISCCP. The cloud cover data, however, should not be affected by this. Already demonstrated by the cloud data referred to here and elsewhere. In fact the data suggested my hypothesis rather than the other way around. The decline in global cloud cover during the late 20th century correlates with more zonal jets and high solar activity. Then when solar activity dropped from around 2000 the jets became more meridional and clouds began to increase again. I’m just waiting for enough time to pass for others to realise that it is a consistent phenomenon (or for it to be rebutted). So what shifts the jets if, as you say, CO2 doesn’t warm the troposphere much ? And don’t refer to the oceans or volcanoes because they don’t reproduce anything on the timescale of MWP to LIA to date. Furthermore the evidence you produced only referred to a cooling of the stratosphere in the region of the shifted jets and NOT the stratosphere as a whole. So, I think the one who fails to ‘get it’ is you. Also, Leif, you said that the stratospheric cooling effect of the CO2 was being offset by the stratospheric warming effect of reduced CFCs and now you suggest that the stratospheric cooling was caused by the shifting jets. Just admit that your narrative is an utter mess and give some credit to those of us who are creating narratives that fit the facts. Ulric is mistaken when he says: “Clearly a negative feedback as the higher the cloud is, the colder it is, and the less it can potentially warm the surface, or keep the surface warmer”. High clouds have a warming effect, and lower clouds tend to have a cooling effect. See http://www.climate4you.com/ > clouds > cloud types. This explains why in a warming world, although clouds become less in quantity, their quality tends towards a positive feedback. An analysis of zonal cloud cover changes suggests poleward shifts of the jet streams in both hemispheres. The observed displacement agrees with other studies. I refer to the previous thread. There is no need to try to high-jack the present thread. And perhaps it would be good if you tone down your rhetoric a bit. Thanks. I am interested in your take on the energy needed. >>Please remember there are lots of cosmic rays that originate from the sun. The galactic cosmic ray flux is a subset of all cosmic rays. Do you agree with the effect (at all) and if so, what do you think is the required energy level to produce nucleation? The reason I ask is that I visited a demonstration given by the Perimeter Institute here in Waterloo and I recall the energy to have been much lower than 10 GeV. Perhaps Svensmark is looking for a certain level of effect rather than ‘nucleation at all’. Perhaps one of you has a chart of the energy:response that points to some minimum energy level, or perhaps at different levels of charge in the atmosphere responding differently. Lets see, low level clouds are increasing, which trap greenhouse heat, and high level clouds reflect in back into space to cause cooling. So these observations should indicate a warming trend according to the AGW crowd, but it is not. So what are have they left out of their immaculate models? Observations appear to show that high and medium clouds decreased when temperatures were rising and increased when temperatures stopped rising around 2000. Low clouds did the opposite. Therefore how can you say that high clouds have a warming effect and low clouds have a cooling effect ? High clouds reflect a lot more solar energy back out to space than low clouds which is consistent with the albedo changes measured by the Earthshine project. It is true that low clouds insulate better than high clouds but in energy budget terms insulation is a less powerful effect than reflection because insulation merely delays energy loss whereas reflection denies energy to the system altogether. The truth is that a solar induced reduction in high and medium clouds allowed more energy in so the system warmed. In the process low clouds increased. Since about 2000 a solar induced increase in high and medium clouds allowed less energy in so the system is now cooling. In the process low clouds have decreased. This thread is about global cloudiness which is linked to jet stream behaviour and the temperature of the stratosphere. If you can say how the stratosphere as a whole (not just in the region of the jets) came to cool whilst the sun was active that would be helpful. Especially since it is no longer cooling with the less active sun. I say the sun did it. Do you say it was CO2 and / or CFCs and /or shifting jets or something else ? Any ideas that fit the facts would be good for this thread. The data does not support the theory, e.g. Svensmark has always maintained that energy higher than 10 GeV is needed. Regardless of other considerations, he has to maintain that, because at lower energies the long-term changes of the Earth’s magnetic field falsifies his theory. First, I appreciate reading WUWT daily. The numbers that relate to de-forestation have intrigued me for some time. I vividly recall driving across the country in 1971 to stage for Vietnam deployment. In the early morning hours, my wife and I could see clouds being born! interesting that the rate of de-forestion seemed to match the cloud loss report. High rates of deforestation and degradation of woodlands continue to threaten the world’s forest biodiversity, the United Nations Food and Agriculture Organization (FAO) said today, but pointed out that there is a positive trend towards the conservation of forests in many countries. Globally, around 13 million hectares of forests were converted to other uses – including agriculture – or were lost through natural causes each year between 2000 and 2010, according to the findings of FAO’s Global Forest Resources Assessment 2010. The trend of forest loss has declined from around 16 million ha per year during the 1990s, the report said. The report, the most comprehensive assessment of the state of the world’s forests ever undertaken, was released today at the start of the latest biennial meeting of the FAO’s Committee on Forestry and World Forest Week, in Rome. More than one third of all forests are classified as primary – showing no visible signs of human intervention. Primary forests, in particular tropical moist forests, include some of the world’s most species-rich and diverse ecosystems. “Observations appear to show that high and medium clouds decreased when temperatures were rising and increased when temperatures stopped rising around 2000”. – Sorry – which observations? I am looking at the climate4you pages. As you know, climate4you is not a “warmist” site, and in any case, it simply presents the data. Observations show that cloud cover decreases in a warmer atmosphere. Spencer says above that “clouds are earth’s sunshade”. Cloud albedo therefore decreases in a warming planet – a positive feedback. Cloud quality changes towards heat trapping – again, a positive feedback. These findings may or may not support Spencer’s hypothesis that cloud changes are the cause and not the effect of temperature changes, but they certainly do undermine the hypothesis that clouds have a net negative feedback. Ok, I accept that refinement. Fits in with HenryP’s point that the inflection point was 1995 or thereabouts rather than 2000 which was when I first noted the jetstream changes from my own observations. The low and medium clouds appear to have been affected by the solar changes a few years earlier than the high clouds. I think 1995 qualifies as ‘around’ 2000 at a pinch.The important thing is the inflection point in all three levels whilst the sun was declining from the peak of cycle 23. [A positive correlation between solar activity and cloud cover is] already demonstrated by the cloud data referred to here and elsewhere. In fact the data suggested my hypothesis rather than the other way around. …I’m just waiting for enough time to pass for others to realise that it is a consistent phenomenon (or for it to be rebutted). – sorry, your reference to data “here and elsewhere” does not amount to a demonstration. If there is a robust relationship between solar activity, cloud cover and jet streams in the way you are speaking of, please either give a reference to it, or get the datasets and create a relationship that you can show us. I’m happy with the inflection point in 1995 but I thought it would have been a bit later. The medium and low cloud data supports you. Pre 1995 I think you have insufficient data for accuracy and the interaction between PDO phases and low cycle 20 might have skewed the numbers anyway. Best thing is to wait and see how the data plays out through the rest of cycle 24 and into cycle 25. I can’t make any progress with Leif and many others unless things go as we expect. The low cycle 24 is a great help for diagnostic purposes but there are still too many reasonable points that others can choose to discount the connections as we see them. I think the position will be resolved naturally in a few years provided the sun stays quiet. It would make sense that completely clear sky conditions would lead to the highest near ground daytime temperatures, think desert. And I don’t see how “wispy clouds can trap much heat, and as they are cold, that in itself proves that they don’t. All they can do is reduce insolation at the surface, and provide virtually no night time warming. Well I’m sorry Ulric, but that’s what we read – from both sides of the divide. If you are interested in it, why not do an in-depth study of the basis for the general statement “High clouds warm, low clouds cool”. Do you have any comment on the increase in forestation of the NE USA over the past 50 years as people left the farms and they returned to mixed woodlands? The area involved is very large (hence the huge recovery of the deer population). Dr Bill Mollison certainly supports the view that trees create precipitation though he is always careful to point out that dewfall from trees can be large, in some cases be larger than the rainfall. Dr St Barbe Baker is another friend who supported the water vapour harvesting by trees idea and helped create the first giant sequoia sanctuary in the 1920’s. He initiated the “Save the Redwoods” campaign in California. It had to be large enough to maintain the microclimate (9000 acres originally, then 20,000). Both of these scientists were preaching from the same trees = clouds+rainfall gospel. St Barbe Baker often talked about reclaiming deserts by planting hardy trees (like peaches) at the edge and working in. Mollison speaks of greatly increasing rainfall with strips of trees about 80 km apart. If there is a clear relationship between tree cover and cloudiness (it would have to be regional to be believable) this deserves close attention because they are a major source of water vapour – 2.5 tons per day in the case of each mature Sequoia. Are these clouds cooling? Maybe there is a demonstrable correlation between increasing tree cover and declining temperatures in the Eastern US (perhaps during some seasons only). They absorb a lot of sunlight. <iPerhaps Svensmark needs to rethink his theory. Is it possible that more cosmic rays would speed up the velocity of the water cycle and mean that more compact precipitation zones (less overall cloudiness) would serve to maintain the heat balance? More cloud seeding elements result in more and smaller droplets. which cause the clouds to be more persistent. That is, take longer to precipitate out. We see this in the Weekend Effect when lower levels of cloud seeding aerosols at the weekend result in increased precipitation, of the order of 20%. And as others have commented above, deforestation is likely playing a significant role in decreasing clouds. Forests impede runoff compared to agricultural land and return water to the atmosphere by transpiration. Here in Australia, a large tree will transpire in excess of 10,000 litres per annum. And no one has mentioned contrails, which is cloud seeding on a global scale. Useful points so let’s build on them. i) The above statement is true only for the period up to 1995 – 2000 during which the warmth peaked around the time of the 1997/8 El Nino. ii) Low level clouds have been decreasing since the mid 90s so less insulation = faster energy loss upwards. iIi) Medium clouds have been increasing since the mid 90s and high clouds have been increasing since the late 90’s = more reflection of incoming solar energy. v) We must now be cooling and in support of that we see a cessation of ocean heat content build up with some evidence that it is actually declining, we have a cessation of earlier tropospheric warming and we have increasing global albedo. At the same time as all that we saw falling solar activity levels and a record negative AO with more meridional jets at around the same time as a record solar minimum after years of positive AO and high levels of solar activity. I read the referenced paper and at best one can say that there is conflicting data. I see a clear general relationship (correlation) between GCR’s for some years and then there is a total disconnect, a view shared by the authors. What was not presented here is that the data upon which the cloudiness aspect is based is somewhat suspect: “It is noted again that the ISCCP lower-troposphere cloud data may not be sufficiently reliable to detect GCR–cloud correlations.” If the data is not reliable enough to detect the correlation, then it would be hard to argue persuasively that it is not there. The paper does not present data from other solar minima v.s. cloudiness at the proposed latitudes and altitudes. All things considered, the (again) contradictory published works on the changes in cloudiness from Forbush events supports both positions. I have seen at least one reference to significant cloud cover changes within hours of the Earth being hit by a CME. Perhaps that was spurious. Would you be so kind as to explain the meaning of the “geomagnetic cutoff rigidity of 2.32 GV” in Kiel v.s. the geomagnetic cutoff rigidity of 9.56 GeV in Beijing? It seems obvious that the GCR flux at different energy threshholds must be sorted out first before looking for correlations. The linked paper does not show this, in fact does not mention the 10 GeV energy threshhold at all. That is odd because though this quote is true, “The latter study in particular explains the extended deep QP between cycles 23 and 24 and the effect of the sun’s very weak polar magnetic field. This in turn explains the record-high GCR levels during the cycle 23–24 QP (see Phillips 2009)” the point is easily made that it was the lower energy and thus most easily deflected GCR’s that were not reaching the Earth before, and now they are. As a result I must judge the paper to be inadequate in terms of falsifying or even significantly denting the Svensmark hypothesis. If there is a paper that discloses the energy level of the GCR’s and shows any previous and current correlation, or lack of it, to cloudiness at the predicted altitudes and latitudes, I would be very interested to read it. My reading of what little came from CERN is that the effect was much stronger than expected in the ‘correct’ energy range. Maybe. But then you might have such a density that the drops start to coalesce, with resulting rain, dissipating the cloud cover. Then again, the droplets are ionized, so perhaps they will repel one another, resulting in very diffuse cloudiness, resulting in reduced albedo. Is this really such as linear relationship as you suggest? Does anyone really know clouds at all? I’m surprised no one has mentioned Miskolczi. If the water vapor has dropped it is exactly as he has claimed with is constant optical depth. In other words, the overall GHE has been constant and cannot be the cause of any warming. No, simple physics does not tell us that there should be less clouds in a warmer world. How on earth do you argue for such an oversimplistic idea and wrong to both? I see a clear general relationship (correlation) between GCR’s for some years and then there is a total disconnect, a view shared by the authors. This is the usual fate of spurious correlations. Somebody picks up what look like a good correlation and then later the effect goes away. If the data is not reliable enough to detect the correlation, then it would be hard to argue persuasively that it is not there. Even harder to argue that there is an effect. A charged particle is deflected by a magnetic field. It is harder to deflect a particle with high energy, so lower energy particles are deflected a lot, so much, in fact, that for each place on the Earth the is minimum energy a particle must have in order to reach the surface. That is called the cutoff rigidity. It is largest at low latitudes and dwindles to zero at the poles. the point is easily made that it was the lower energy and thus most easily deflected GCR’s that were not reaching the Earth before, and now they are. As a result I must judge the paper to be inadequate in terms of falsifying or even significantly denting the Svensmark hypothesis. There is some confusion here. The Earth’s magnetic field deflects cosmic rays and the solar wind does too, but in different ways. Above, say 20 GeV, there is almost no modulation by the Sun [no deflection], but all of those rays reach the Earth’s surface [also no deflection]. Below 10 GeV there is some modulation by the Sun [i.e. a solar cycle variation of the intensity of the cosmic rays] but most of those rays do not reach low latitudes. So there is a ‘sweet’ spot somewhere between 10 and 20 GeV where there is just enough modulation by the Sun and where just enough rays reach the surface. Svensmark needs to hit that sweet spot [a special pleading] for the effect to work. And herein lies his problem. The Earth’s deflecting ‘power’ depends on its magnetic field [stronger field = more deflection]. In the last several hundred years the Earth’s magnetic field has become weaker, so more cosmic rays reaches the surface which should have cooled the Earth [according to Svensmark] the past few hundred years, yet the Earth has warmed [‘climbed out of the LIA’ people say]. If there is a paper that discloses the energy level of the GCR’s and shows any previous and current correlation, or lack of it, to cloudiness at the predicted altitudes and latitudes, I would be very interested to read it. The paper I referred you to is a good start. But it is really difficult to pin this down as ir seems to a moving target. One would think that Svensmark himslef would have written such a definitive paper, but it seems to lacking. ““High clouds warm, low clouds cool”. The only apparent observation is that the air just below cirrus clouds can warm by around 10°C (which sounds like inhibited convection), but I don’t see how -20°C or less up there can make the ground warmer. Are we really to believe that the far larger amounts of cirrus clouds above the tropics are acting as a positive feedback? And again, does an equatorial desert really reach higher midday surface temperatures when cirrus cloud is present? Our calculated transmission of sunlight through cirrus is much larger than measurements indicate. I’m agnostic on GCR cloud seeding. I thought the theory elegant, but elegant theories aren’t always right, and as Leif points out, the lack of a consistent correlation is persuasive that GCRs don’t seed clouds. Perhaps there is some threshold effect at work. As you say, there is a great deal we don’t know about clouds. The aerosol seeding – cloud persistence relationship is well accepted. And should hold for any seeding agent. Neither of these are following the temp’ changes, unlike low and mid level clouds. Are we talking about diurnal cloud formation, where the afternoon heat produces cumulonimbus (800-400 mbar), attenuating heat accumulation/transfer from above) during sunny side exposure and attenuating OLR at night? Opacity is key, both visible, IR, OLR and the surface, between night-side and dayside. I appreciate the conversation. I agree that there needs to be more consideration of the precursor conditions. It is spoken of as if there is ‘nothing’ in the air and then a whizz-bang cosmic ray comes along and creates a CCN. The very detailed (agonisingly detailed) explanation of the process I read (not Svensmark) covering every aspect of CCN formation in different sizes and with different charges and their tendency to avoid each other and not to do so shows that the result of let’s call it the ‘electric’ or ‘zapper’ effect varies widely depending in the initial conditions. In supersaturated air it is pretty easy to get a condensation process going. For me, it is difficult to rule out the effect completely. There is too much solid evidence (actual formation of CCN) and reasonable theoretical mechanisms for it. Extrapolating that to clouds is less secure, but not ruled out. An important consideration is taht GCR-CCNs are smaller and tend to last longer in a light-interactng state before coagulating into larger droplets. I note Leif’s comment that the LIA ended with some contrary evidence but there are lots of other processes going on and it is a bit of a straw man argument to ask that the mechanism override all other large effects then say it failed to do so. I work with one of the top atmospheric particle people, a nuclear physicist, and he finds the cause-effect very convincing and teaches some of the physics to all his students. That there is any effect known to be true, the details are: how big is the effect, when, what overrides it and to what extent. I would not be able to argue convincingly that there is no effect – that GCR does not cause CCN formation. It obviously does and it is not a difficult effect to demonstrate, which Svensmark did with a pretty small budget. The CERN result boiled down to, “The effect is there, it is bigger than we thought, don’t read too much into it, we need 5 years of funding to really know much for sure, we’ll get back to you.” Sounds familiar. That there is any effect known to be true, the details are: how big is the effect, when, what overrides it and to what extent. I would not be able to argue convincingly that there is no effect – that GCR does not cause CCN formation. It obviously does and it is not a difficult effect to demonstrate, which Svensmark did with a pretty small budget. As usual, it is all about relative size. Even Jupiter Shine has an effect. The question is if the GCR effect is large enough to be of any importance. And that is where it fails. The very fact that there is no general and overwhelming support for the effect [so we need not even discuss it – as we no longer argue whether the Earth is round or flat] is due to the other fact that the correlations are dubious, contradictory, and hard to agree on. Now, the GCR effect has attained the status of dogma which has a life of its own and in some circles may not be denied or doubted, quite on par with CAGW. Also, the hypothesis is a moving target, if it is not the low clouds, perhaps it is a special type of cloud, or maybe a kind of cloud not yet discovered. Science is full of hypothesis that have died a tortuous death, twisting left, right, and round trying to connect the dots where no connections [and at time even no dots] exist. Well doc, not only are those higher clouds colder, as Ulric said, but they also are much less dense in terms of water content, so there are fewer water molecules to absorb the LWIR emissions from the surface. Also those clouds do not reflect particularly in the LWIR. In the visible, where we see them, they optically scatter. Water has only a 2% reflectance , in the visible and most of the solar energy containing spectrum. The point is that the scattered light is isotropic so it is widely dispersed, spatially, and much of it is simply lost to space. In the LWIR water is highly absorbing. 1/e absorption length is about 1.25 microns at 3.0 microns, wavelegth, and certainly below 12.5 microns for the 288 K surface LWIR peakig around 10.1 microns. So those high clouds absorb; (so do the low ones only moreso because more water molecules) they do NOT reflect LWIR. Yes they do re-radiate, presumably at water IR bands. The liquid or solid water should also emit a thermal continuum radiation spectrum characteristic of the water Temperature, and that emission is also isotropic so widely scattered with half escaping upward..
We have to keep in mind that the principal source of WARMING LWIR ENERGY for those clouds, is about like an ordinary bottle of drinking water out of the refrigerator. It is nothing like a 100 Watt incandescent light bulb radiating at half the surface temperature of the sun, with a peak of spectral radiance, that is 10^5 times brighter than what the earth surface, or that bottle of water is radiating. THAT is what is “warming” the cloud; high or low, and the even colder cloud, is what subsequently heats up the earth surface that was warming the cloud. Those wispy high night time clouds, that warm you up over night, were actually caused by an even warmer daytime Temperature; and the warmer it was during the day, the higher the altitude of the dew point, so the higher the altitude of the night time clouds. It is pure bunk, that high clouds warm the surface; the warm surface caused the high clouds, and after sun down, the surface Temperature will fall; not rise, and it will be much colder in the morning. The Temperature never goes up at night, unless some warm air mass from some hotter place, moves in over night; which is convective heating, ot greenhouse gas or cloud heating. Every single extra water molecule added to the atmosphere (CO2 as well), absobs additional incoming solar energy, which warms the atmosphere but cools the ground/ocean. And the atmosphere can’t heat the ground, because the conduction and convection are both in the wrong direction (rising), while the radiation is split half up and half down. The upward convection results in a downflow of cold air, which actually cools the ground.. Solar spectrum energy, that in the normal scheme of things gets deposited deep in the ocean (at least some down to 700 metres); but is instead captured by greenhouse gases H2O, O3, and CO2, NEVER EVER gets stored in the deep ocean. What increased emission in the LWIR from that warmed atmosphere, does reach the surface (only half) is absorbed in the top 50 microns of ocean surface, and largely just prompts increased evaporation; which is a cooling process, not a warming one. See Wentz et al; “How much More Rain, will Global Warming bring?” SCIENCE, 7th July, 2007. Higher Nimbostratus IIRC are deemed to negatively correlate with temps since their primary effect is on albedo. Less NS means more energy entering the system. The second graph in this post suggests that NS is driving change and CN is the compensating feedback reaction. So what is controlling Nimbostratus formation ….? Is there any hypothesis suffering a tortuous death that could possibly explain this? Nobody believes Hansen’s ISCCP cloud data. I would just throw this part of the data out and see what else the paper shows. I don’t think there has been a demonstration that a consistent correlation is lacking. Just perhaps not the one you’re looking for. I think there is simply no supporting evidence or physics behind the claim that the global warming over the past century could simply be attributed to internal variability. Spencer’s hypothesis cannot account for numerous observed changes in the global climate (which are consistent with an increased greenhouse effect), does not have a known physical mechanism, and there are simply better explanations for interactions between global temperature and cloud cover. Garner was a race car hobbiest. Other actors, like Paul Neuman or Steve McQueen or Bert Reynolds, were race car enthusiasts. Even Jay Leno might be tossed in with the bunch. None, to my knowledge, ever ran a lap during any Indy. But drive race cars? You betcha! The owners loved the PR and the photo ops. It’s apparent that clouds are getting a lot of attention lately. This paper along with Spencer-Braswell 2011, and also this one by Miller et al http://journals.ametsoc.org/doi/abs/10.1175/JCLI-D-11-00072.1 seem to be consistent that clouds are not represented well in climate models and inversely effect temperature. Whether a forcing or a feedback seems to now be a valid question. Maybe Spencer and Braswell were not as off base as the ridicule of them suggested? Hi Jane! I think you will find very few people on this blog who still believe in that fairy tale. The first problem I encountered in my own investigation was that the ratio of maxima-means-minima is opposite of what you would expect it to be if it were indeed an increased GH effect causing warming of earth. Clearly: it is from the top down: increasing maxima pushing up means and minima, if you look at it globally and not only at a few selected places on earth, like Las Vegas, that have special circumstances. By measuring the speed of warming against time (acceleration/deceleration ) I figured that the maximum input of energy into earth occured in 1995. Note that the graph for the decelereation of the warming is completely natural, like the traject of a thrown object. Geewhizz, we can do a monkey puzzle survey and see/hear everyone’s most favourite explanation for the warming? F. sun cycle activity related to a small variation in UV light from the sun, which affects the amount of ozone production in the stratosphere (a certain type UV light converts oxygen into ozone); ozone re-radiates a lot of high energy sunlight to outer space and if there is less of it allows more energy in. Take your pick. You can also chose a combination. I’d be interested to hear all the choices here on this blog? you are correct in your recollection. This is really an assumption made by lacis and hansen (et al) from a late 1980s vintage paper that they use now as a “fact”. There are several problems with the basic concept which is higher temperature reduces cloud cover despite there being more h2o vapor available to make clouds. as for the problems, first off, that would mean the Earth only can have a cloud cover of no more than around 60% because when T drops, cloud cover drops and when T rises, cloud cover drops. There could be no 70, 80, 90, or 100% cloud cover possible at any T. Second, there could be no stable operating point to limit T from feedback if this were true. In other words, a small increase in T would decrease the clouds and create a large increase in T – totally unstable positive feedback which would drive the T to the upper rail and keep it there. Third, clouds form when lighter, (and warmer due to IR absorption) h2o vapor rises up through the atmosphere where it encounters lower T emperatures and the RH reaches about 100%. This mechanism doesn’t go away just because there is a small change in T at the surface as there will be an altitude where clouds will form if there is h2o vapor present and it is able to reach that altitude. Fourth, this idea from the hansen paper is one of these things invented to provide a reason why there might be catastrophic positive feedback in order for there to be the possibility of catastrophic warming. It’s not part of a scientific hypothesis to an explain an observed or calculated phenomenon but rather is a hypothesis to promote an assumption (and an agenda). Finally, after observing albedo (finally) for a number of years, it was observed that it has varied by enough to be the equivalent of 2 or 3 co2 doublings and has recovered from the excursions, despite its changes and the changes in T related to it. As stated above, if cloud cover variations come form T, we’d be in an unstable equilibrium and would have slipped off of it, never to recover. While it is possible to have a two way street – like co2 can affect the T and the T for the oceans can affect the co2 absorption in the oceans so that more co2 warms and warmer oceans emit more co2 due to less ability to absorb due to warmer T, there can only be one net result. There can be a net positive feedback or a net negative feedback, or no effect due to perfect cancellation. If cloud cover has a net effect, then it can either be only net positive or it can only be net negative. If it is net positive, then there is no stability or regulating effect possible and T will vary more. If it is net negative, then T variations will be less than it would have varied without the presence of clouds. Considering that the presence of clouds reduces incoming solar energy at the surface and slows the evaporation cycle, it only makes sense that it is a net negative feedback mechanism that provides control and stability to the Earth system. Note that these ideas are simplified and different types of clouds have different effects and they have different timings of formation and dissipation and that there is a 24 hr cycle of incoming power from the sun that varies over latitude and year . Also note that many factors affect both clouds and albedo of those clouds. Changing droplet sizes of the particles can change the albedo or reflectivity of the cloud without the need to change the coverage fraction. This is the Achille’s heel of the CAGW movement and of the majority of attempts at measuring sensitivity to forcings which show wide variations in results and seem to support the possibility of catastrophe. It is clear that whatever is warming the planet, must be driving weather system changes in order to do that. Temperature change is a result of weather system change. You cannot get around that statement to talk about CO2. So whatever is being touted as the temperature driver must be “joule” capable of that feat (affect weather system patterns over the long term) and make a fairly continuous long-term effort to sustain those weather system changes to make an anomalous difference on the temperature trend. Here is the reason anthropogenic CO2 cannot be the driver. The anthropogenic portion of the increase in CO2 ppm has not done its magic on water vapor (water vapor must anthropogenically increase in order to cause more heat to be held at the surface in order for the CO2 theory to work). Water vapor increase is a weather-related event. Anthropogenic CO2 does not have the joules necessary to cause weather system changes that would lead to increased water vapor that would lead to global warming. End of story. Simple values give us averages of what’s going on. The surface average is around 288.2k and radiates around 390 W/m^2. The incoming average solar incomming is around 341 w/m^2 and the albedo is around 0.3. That means we’ve got about (1-0.3)* 341 =~ 239 w/^2 being absorbed by the Earth/atmosphere. For a rough balance, that means around 239 W/m^2 must be radiated from Earth. 239/390 = 61% of the surface emissions escape (or are reradiated from the atmosphere), leaving about 390-239 = ~ 151 w/m^2 being trapped in the atmosphere. Of that, about 2/3 is ghg absorption with roughly 2/3 being h2o vapor and 1/3 being co2 (60 & 30 W/m^2), and 1/3 or about 50 w/m^2 is cloud absorption, etc. A blackbody at 255K would emit about 239 w/m^2 and 288-255 = 33 deg C which is the T increase due to that ~151 W/m^2 of absorption. 33/151 = ~ 0.22 deg C rise per W/m^2 overall average. Also, we’ve got about 0.62 cloud cover (62%) and an albedo contribution of around 0.22 for clouds and atmosphere versus around 0.08 for surface albedo. Clouds will radiate a continuum at their cloud top T and it will be above most h2o vapor and above lots of the other ghgs and at lower temperatures so that emission lines are narrower when it comes to additional outgoing absorption. Note too that radiative programs like modcalc will show a clear sky radiation rate near 270 W/m^2 which is significantly above the average 239 W/m^2 needed for balance. If you eliminated clouds, the surface would have to cool to reduce the output from 270 to 239 w/m^2 and that corresponds to a reduction of 31 w/m^2 escaping, reducing the T by almost 6 deg C to 282k assuming the albedo didn’t change. Allowing about 14w/m^2 for atmospheric scattering and eliminating cloud albedo, one would have around 41 w/m^2 of albedo ( a =0.12) and incoming solar average of 341 – 41 = ~ 300 w/m^2. Now we need a new balance of 300 w/m^2 rather than 239w/m^2 so our clear skies 270 w/m^2 radiation output is now low by 30 w/m^2. Applying that to surface T using again Stefan’s law, our clear sky emission of 270 W/m^2 + 30 W/m^2 gives us 300W/m^2. The surface would need to heat up by enough T to emit an additional 30 w/m^2. Starting with the current 288.2k with 391 w/m^2 and adding 30 w/m^2, we get a new surface T of 293.5k which is a warming of 5.3 deg C.
Hence, taking away clouds actually increases the T. That must mean that adding cloud cover must reduce the T, at least in our current condition of no massive lower latitude glaciation. 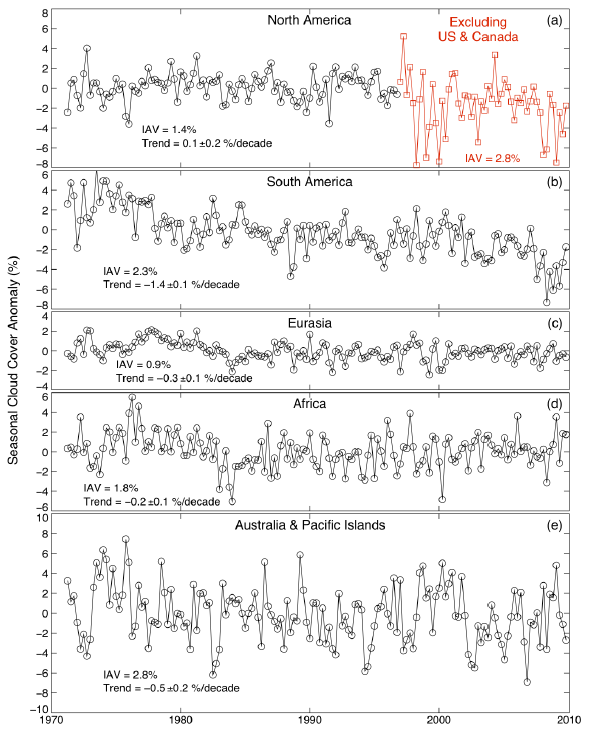 This paper does a decent job of examining temperature response to ENSO events. It further testifies as to the nature of temperature trends. Anomalous trends are more than likely a weather system pattern change. The AGW theory must address whether or not anthropogenic CO2 is capable of affecting ENSO parameters to the extent that it can, for decades, drive these parameters in a direction that results in positive temperature trends. ….Simple physics teaches us that less cloud is to be expected in a warmer atmosphere…. ERRrrr, I do not think so. Warmer atmosphere will cause more cloud cover due to increased evaporation. I did a quick and dirty look-see along the Eastern Seaboard of the USA a few years ago to check out my observations from living in several places in the USA and Willis’s Thermostat Theory. The number of summer storms decreases as you move north. Going from ~ 20 per month (July & August) in Florida to less than 10 per month north of Raleigh NC. This was when the Jet Stream was still zonal and not the more meridional jets we are seeing now. At that time the wind was consistently out of the west. This means the towns I looked at (~ 100 to 200 miles inland) were in the rain shadow of the Appalachians. The last couple of years the winds coming from all directions so the ocean moisture is coming more into play and we are seeing more rain. Despite the screaming headlines this has been a very soggy summer. I can still dig fence posts in my clay soil. Normally even the tractor can not get through the baked brick soil in the summer. Thank you for the link to Richard St. Barbe Baker’s re-forestation efforts. Clearly, he was a great conservationist. 1. The CO2 graph has appeared to me to be a linear function. 2. De-forestation and agricultural growth along with population growth over the past 150 years are the best matches I’ve seen with the CO2 graph. However the loss of trees, at massive scale isn’t just the recent Palm Oil / Rain Forest situation. 1 Gypsy Moth – Imported for to strengthen silkworms. Some escaped. Now, vast stretches of forest defoliate from Maine to Virginia and West to Ohio. 2. Dutch elm disease – Came in two waves. It was the second in the late 1920s where the virus was lethal. This strain also bounced back to Europe. The numbers are staggering. 25 million in the U.K., 80 to 100 million in the U.S. and still spreading. Canada is next. 3. The worst is the pine beetle. The following New York Times article focuses on the Western USA and Canada. However, these bad guys have moved South as well. The net rule of thumb is: 50 acres of trees cleans 1 SUV/yr. The cloud formation potential is a possible second benefit. Well Gail, and others who question that less cloud is to be expected in a warmer atmosphere, Please click on this link : http://climate4you.com/ . This is a not a warmist site, it is a sceptic site. Click on “Climate and Clouds”, then on “Cloud clover effects on climate”. There you will find, under a diagram of the effects of clouds (High warming, low cooling, sorry) which graphically displays the observation that cloud cover is inversely proportional to global surface air temperature. As temperature goes up, so cloud cover goes down. A cooler earth has more cloud. A warmer atmosphere has less cloud. That is, cloud cover has decreased as the planet has warmed over the past 40 years. So whatever theoretical explanations anyone may advance to the contrary, the fact remains that cloud cover decreases as the planet warms. As we should expect, since water vapour tends to condense into clouds less easily in warm air. You are assuming cause in the cloud – surface temperature relationship. Assume a static climate and then reduce the level of aerosols. This decreases cloud persistence and generally cloud reflectivity. Surface temperatures rise. If as you claim, increase surface temperatures cause decreased clouds, Decreased aerosols, as has happened across much of the world over the last 40 years, would cause a positive feedback loop and runaway warming. This hasn’t happened. Therefore, increased surface temperatures do not cause decreased clouds. Well doc, I much prefer actual real world experimental observation and measurement to blog pots, rgeardless of the point of view (bias if yoy will) of the blogger. Briefly they found the INCREASE rate for a one deg C mean global Temperature increase, was 7% for ALL THREE of those variables. Not surprising that total global precipitation always equals total global evaporation; tends to keep the oceans from being overhead. The GCMs also agreed on those two rates. Not so surprising, since the evap is little more than the Clausius Clapeyron equation in action. But the super models claimed only a 1-3% increase in total atmospheric water content, globally. That is an error of as much as a factor of seven from actual real physical experimental observations and measurements. Now, I don’t recall Wentz et al, actually mentioning the amount, density or persistence of cloud cover; nor the locations where clouds tended to form. If a one degree rise in global mean Temperature observationally results in a 7% increase in total global precipitation; just take a wild arse hip shoot guess as to what might be the amount of INCREASE in total global PRECIPITABLE CLOUD COVER / AREA / DENSITY / PERSISTENCE TIME ?? I don’t know about your local climate / weather, but everywhere I have ever been, it has been customary to have precipitable clouds associated with precipitation. I would tend to put my money on about a 7% increase in precipitable cloud cover; but that is not any peer reviewed observation; or even a terracomputerflop computation; really just a WAG ! High and medium clouds decreased whilst the globe was warming and are now increasing as the globe cools. Low clouds increased with warming and are now decreasing with cooling. What we see is a shift in the balance between insulation from low clouds and reflection by high clouds. For temperature to be causing the cloud changes you somehow have to change temperature first without any change in solar input to the oceans. It is proposed that CO2 was the cause but that has been falsified by the changes in trend of both cloudiness and temperature since the late 90s whilst CO2 continues to rise. Thus the change in cloudiness has to come first in order to allow more energy into the oceans and warm up the globe. A decrease in high and medium reduces reflection to allow more energy in and an increase in low clouds at the same time holds the energy in the oceans longer via increased insulation. Thus warming as per the late 20th century. We now have an increase in high and medium for more reflection and a decrease in low for less insulation. A cooling setup which is now affecting ocean heat content but has yet to fully impact on the troposphere. If one were able to increase temperature first, with cloudiness following, then that extra warmth would produce more clouds and precipitation and not less clouds and precipitation. AGW theory proposes that increased warmth from more CO2 produces more water vapour from increased evaporation but then proposes that somehow the extra water vapour fails to condense to form clouds and precipitation. We can discount that because global humidity shows either no change or a change in the wrong direction and anyway the link is already falsified as I pointed out above. In practice what happens is that the sun changes the circulation to reduce high and medium clouds but low clouds increase somewhat leaving humidity much the same. Cloud totals fall because high and medium clouds are deeper than low clouds and so have a greater effect on total cloud quantities if they change volume. Warming then occurs which energises the convective processes in the tropics and in due course also the mid latitude depressions. As energy is pushed poleward faster.In the process clouds and precipitation do increase but that is not the primary driver. That is simply the negative system response responding to the original solar effect from above which was to cause a global cloud reduction.The faster processes are offsetting the increase in energy to the oceans by increasing the rate of loss to space. The whole thing reverses when the sun changes the circulation in the other direction. Then, the solar effect is to increase high and medium but reduce low. Cooling then occurs which reduces the convective processes in the tropics and the mid latitude depressions are able to wander about more freely but again that is not the primary driver. That is simply the negative system response to the original solar effect which was to cause a global cloud increase.The slower processes are trying to offset the decrease in energy to the oceans by reducing the rate of loss to space. The secret behind all this is that whatever happens to the energy budget the air circulation will always respond in a negative fashion so as to maintain system energy by matching longwave radiation out to solar radiation coming in. In the process of achieving that balance the atmospheric heights change, the gradient of tropopause height between equator and poles changes and the climate zones and jets shift about latitudinally with changes in the amount of cloudiness being caused by the changes in jetstream behaviour between zonality and meridionality. An active sun causes less clouds by causing more zonality and a quiet sun causes more clouds by increasing meridionality. The sun achieves that effect by altering ozone chemistry differentially between equator and poles so that the tropopause height gradient changes between equator and poles. The reason that the thermal energy balance must be maintained is related to atmospheric pressure but that is another story. In light of your previous post, don’t you think the E and F can go together? Well, at least it seems logical to me that from F changes in clouds also follow. That means one could link changes in sun cycle activity to cloud streams and- formation as well. Yes, they go together but I’m not sure that re-radiation by ozone is a major factor. More likely there is a change in the quantities of ozone available to warm up in response to incoming solar irradiation. It is the amount of ozone present that creates the temperature inversion in the stratosphere when it warms up from solar irradiation.The more there is the stronger the inversion. Anyway, that isn’t critical. For whatever reason the changes in solar activity alter stratospheric temperatures over the poles differently to the change over the equator so that the slope of the tropopause height changes between equator and poles. You have to change the temperature of the stratosphere relative to that of the troposphere in order to change tropopause height and it would be unlikely that any solar effect would be proportionately identical at both equator and poles due to the uneven distribution of incoming energy onto a sphere with a magnetic field giving priority to some of the incoming at the poles and the atmosphere being higher above the equator. Differing stratospheric thermal effects at equator and poles alter the tropopause height gradient to allow latitudinal climate zone and jetstream shifting. i) More poleward jets with less clouds allows both more energy in AND more energy out. ii) More equatorward jets with more clouds allows both less energy in AND less energy out. In the process there are all sorts of regional changes in the air circulation which we call climate change but the system energy content changes very little. There is a basic misunderstanding there. But I have noticed that you are not the only one who does not see what the ozone is really doing. Now look in the oxygen – ozone spectrum on the left hand side and compare it with the incoming solar radiation on the left top. Do you see that the ozone cuts off a lot of incoming solar radiation before 0.3 um? The raleigh scattering also has an effect there, but if you look sideways you will notice that that is really only in a tail. The bulk of the difference i.e the white area between the red line and the actual red area, is due to the ozone re-radiation. Once you got it, you will realize that a small effect in ozone level, may produce an enormous effect on the incoming high level energy <0.3 um radiation, which is what heats the oceans…, mostly. (Water absorbs in the UV and therefore that radiation must immediately be transformed to heat. There is also some absorption of water in the visible and IR regions, but try heating some water with a beam of such light… it will take a long, long time….). Another pointer to this reasoning of the fluctuation in ozone being the major factor causing warming and cooling periods is that if the ozone hole (in the SH) gets bigger – as it did in the warm period 1945-1995 – more radiation of <0.3 comes in, through the hole so to speak, without any restriction or barrier whatsoever. That explains my results. Come on everyone. Peter Stroud is correct…. As far as I am concerned we are still at the stage where we are trying to list all the factors that might influence the climate and the list is still far from complete. The sun of course is the origin of ~ all the energy in the system so relegating it to a minor roll seems a bit hasty at least at this time. When ever you have a system this complex you are going to have confounding factors up the wazoo so the “CO2 is the Control Knob” crap is idiotic. – Interesting. 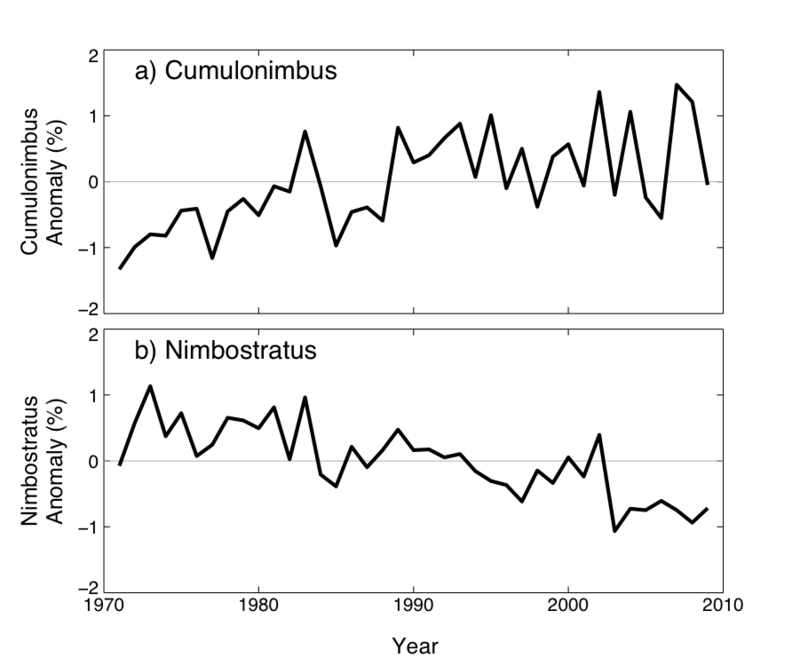 Cirrus and cirrostratus seem to have decreased markedly in 1992, following cooling produced by Pinatubo volcano in 1991. Cirrus has a bit of an increase after the warm year of 1998. Otherwise as you say there is no trend visible to the naked eye. Another piece of evidence is from farming. We pray for LOW CLOUDS to provide insulation when the temperatures might dip to below freezing. Farmers even set up misters to provide more humidity AT GROUND LEVEL. ….In cloudy, breezy weather, the observed lows are likely to be very close to forecast values, but under clear, calm conditions, frost may need to be anticipated even when no frost is forecast…. All frost/freeze protection methods are based on preventing or replacing radiant heat loss…. Fog; Man-made fog has been tried as a frost-protection method. The principle is to duplicate the greenhouse effect. If a “cloud” could be produced blanketing the crop area, it would decrease the radiative cooling and stop the plant from dropping to the critical temperature. So far, there has been some experimental success but a practical system has not been developed. The difficulty lies in producing droplets large enough to block the outgoing longwave radiation and keeping them in the atmosphere without losing them to evaporation. Stephen, you have a broad set of conjectures, but they need to be tested against data, and presented systematically. Again suggesting a negative feedback. As is obvious from your links, there is no detailed [or even gross] correlation. I don’t have a problem with that because if ozone above the tropopause causes warming and thus a temperature inversion then it can only do it by absorption and reradiation to the surrounding molecules before that energy is lost to space again. If the energy is being processed at that height then it is being denied to the oceans as you suggest. Anyway, the details of the relevant processes don’t matter from my point of view and if you have added some useful detail then I appreciate that. My main question would be as to the scale of the direct ozone reradiation effect as compared to the indirect cloudiness changes affecting albedo. And it just occurs to me that according to Miscolczi there has been no change in optical depth but it could be that the change caused by the ozone might be offset by something else such as a humidity reduction. I’m sure we are on the right track but there is a lot of detail to fill in. Well they are presented systematically because they pull all the observations into a plausible narrative with causes and effects properly sorted out (in my opinion). I agree that we do need more of the right sort of data to test it all but such data as has been coming to the fore seems supportive so far. Gail, I don’t know about ALL horticultural crops; but I do know something about “fog”/clouds when it comes to grape crops freezing. And the methodology is quite different, and vastly more powerful, than trying to slpw cooling by LWIR interception. The change in cooling rate by altering fog density is mighty puny at best. A much more potent physics process is employed. A typical wine grape vineyard that I built (paid to have built) was an 80 acre square parcel, surrounding a square central one acre lake. The lake was filled by a classical windmill, which pumped groundwater whenever wind blew, and could be augmented by a powered well pump for when the wind didn’t blow enough. The 80 acres was fitted with a distributed fine spraying system, linked to the powered pump. When a freeze was predicted, as the air Temperature got down to zero deg C, the pump came on, and the sprinkler system sprayed a not too fine spray over the vines. This was a spray, and NOT a mist. The water sprayed onto the vines and grapes, and of course started to freeze. The pumps could not keep up with the total spray rate, but they could replenish the lake fast enough so it took about 24 hours to drain the whole lake, which is about twice the longest freeze in these parts. So long as the spray continues and ice forms, the Temperature of the grapes and vines never goes below zero deg C, and to boot, the cold atmosphere has to remove an enormous 80 calories per gram of water, for it to freeze.. Somewhat more actually because the well water was typically 68 deg F (20 deg C), so it takes 100 alories per gram to freeze that water. The liquids in the grapes and plant cells are full of sugars and stuff and they are good down to well below zero, so the crps never freeze. The latent heat of freezing is a superior freeze inhibitor to a puny GHG radiation blockage. Thanks for the heads-up about Frank Wentz. I could not see his original paper, but he gave an interview about his work here: http://earthsky.org/earth/frank-wentz-will-global-warming-bring-more-rainfall. He says “I certainly wouldn’t claim that we have any definitive answers. I think, though, we’ve been able to leave behind the upper and lower rates of the expected increase in rain. But to determine what the exact increase is going to be and where the increased rain is going to fall, those are questions that still need to be answered”. His work confirms that the total water vapour content of the atmosphere will increase in a warming world (mentioning that 99% of the H2O in the atmosphere is as vapour, only 1% as cloud), which confirms the first major positive feedback. “What’s the most important thing you want people today to know about global warming and rainfall? Global warming is real. It’s not a hoax. However, one should not expect a perfectly steady increase in temperature. We’ve already seen in the 1990′s that there was a relatively large amount of warming and moistening while this last decade, 2000 – 2010, the warming trends have decreased some. But this type of variability is to be expected and it doesn’t mean that global warming isn’t occurring. However, he makes no mention of clouds at all in the interview. I take your point that we should expect more cloud if there is more rain; but if this conversation has taught us anything, it is that cloud science is ridiculously complicated. and despite your stricutres, george, the very clear figure on climate4you is based on observations, and shows unambiguously that cloud cover is inversely proportional to temperature. How can Wentz be reconciled with these observations? One possibility is through a shift towards CuNims (as shown), where the vapour is condensed, stored vertically and precipitated in a short time, as opposed to stratus clouds, where the opposite happens. If Wentz is right, the models have been underestimating the amount of water vapour in a warming world, and therefore underestimating (to whatever degree) climate sensitivity and this is the important conclusion. All in all, this conversation shows the immense complexity of cloud science, its mixture of positive and negative feedbacks. Out of all these complex interactions, there must be some net outcome, and I suspect that Dessler is probably right in concluding that clouds have a weak positive feedback effect. If clouds are present in winter, frost does not form. If it is a clear starry night it forms. Clouds do keep the temps down in summer, but humidity may rise. And from my experience watch the weather become more volatile during the change in seasons. It might be of interest though a 10 year research project covered the effect on weather and precipitation patterns in South America after expansive tree felling and turning into agricultural land. The level of the clouds rose, and precipitation patterns changed were noticed even 200 kms away. Therefore the natural run off to the Amazon decreased. There is some sense in avoiding expansive block tree clearing. However it was noticed if they left strips of rain forest with smaller areas of grazing land in between, this did not effect the precipitation levels so much or hardly noticeable. I can’t remember the equations but I think it was for every acre cleared they should leave 5 acres uncleared. It then remains self sustaining. Just a note on clouds and forest which others have mentioned. It is well known that tropical forests, through evapotranspiration, produce their own cloud. There must be a minimum area of forest that can sustain a cloud. I have a recollection that the great Wangari Maathai (founder of the Green Belt Movement that has planted millions of trees in Africa) said that 15 sq km of forest would generate a cloud, but I have been unable to trace the source of this figure. I disagree, there is much correlation of timing and direction of change, but less with extent, as would be expected due to things like seasonal effects, e.g the majority of the biggest spikes in Cirrus are around mid year. Actually with the aid of the edge of a sheet of paper parallel to the y-axis on the graphs, in each year, season by season. Do clouds migrate upward as they age? I think they do. Daily convection cycles in humid air produce clouds at low levels, 5000 ft or less. Where do the mid-level clouds come from? At the top of the cloud sunlight is being scattered, which means little heat is being absorbed. At the bottom of the cloud “clear window” IR from the surface is being absorbed so the bottom of the cloud warms, the water droplets evaporate, and the warm humid air migrates to the top of the cloud where the water droplets re-condense, and the whole cloud moves upward in the process. I speculate that the increase in mid-level clouds and decrease in low-level clouds simply indicates that clouds are more persistent now than in the past. This would be consistent with reduced large-scale convective activity. Well doc, you and I both know that although “what gose up must come down” , there is no assurance that it will come down where you want it to. The whole Monsoon phenomenon, is indicative of the problem. The location of the evaporation, and the subsequent precipitation is of course all in the fine print of the global weather system and ultimately climate, and we should not expect it to be static over longer time intervals. I believe this is why some people mistake global warming being associated with droughts. Globally, it must result in greater precipitation, but not surprisingly that may result in drought conditions moving in on some locations. The Oklahoma dust bowls of the 1930s would seem to be such an event, since that was also a period of notable warming; and might actually be the prototype of what is currently being experienced in the USA. Now someone somewhere is reaping the benefit of the recent warming prior to the current plateau. In this I plead total ignorance of where it goes to; that’s above my pay grade. The Wentz paper in SCIENCE is in my opinion one of the seminal papers in weather/climate peer reviewed literature, and I urge you to beg, borrow or steal a copy of it from a local or university library, if the cloud subject tickles your fancy which I sense is the case. The point is that it puts the cloud issue into the ” Duh !! ” category, once you understand it. The other cloud issue is of course the high low cloudy warm night issue. It’s simply a question of which is the “cause”, and which is the “effect”. The high evening clouds are the result of the hot muggy day before; which also is the direct cause of the warm balmy night. The Temperature WILL go down at night; NOT up ! There’s a matter of causality when it comes to less clouds. You are assuming that higher T causes fewer clouds. The alternative causality is fewer clouds cause higher T. We already know that that this alternative is true (for low clouds) due to albedo and that it is easily understood conceptually and that it is an extremely strong effect. Consequently, both cannot be true as one would have total runaway feedback with not even unstable equilibrium possible. Also, the flip side of a cooling T causing an increase in cloud cover would result in a snowball Earth if true and the T decreased slight due to massive unstable positive feedback. As for a conceptual mechanism for T causing less cloud cover, you are conveniently forgetting about the existence of a lapse rate. A warmer surface and atmosphere still has a lapse rate so that at some altitude, there will be a given T or at some altitude there will be a T differential from the surface. Moist air will be lighter in density and will absorb more IR – thus becoming warmer and even lower in density than surrounding dry air and hence will rise until that is no longer true regardless of some small difference in T as compared to a slightly lower T example where clouds would form. The result might be that the warmer T cloud forms at a slightly higher altitude versus a slightly lower altitude but that doesn’t mean there has to be somewhat less cloud cover. Lower cloud cover means more energy arriving at the surface – most of which is water and so you will have higher rates of evaporation going on. As stated earlier, that higher evaporation rate must be countered by added rain fall. where we can see that high global surface air temperature is associated with less cloud, and lower surface air temperature is associated with more cloud. Specifically, a GST of 15.4*C is associated with cloud cover of 63.5%, and 15.1*C is associated with cloud cover of 69%. I make that 8.7% decrease in cloud for a 0.3*C increase in T, or 2.9% decrease in cloud for each 0.1*C increase. Are we agreed on these observations, before we plunge off into the thickets of causality? A key issue is whether more Cirrus clouds actually increase day time surface temperatures as claimed. The majority of Cirrus clouds are in the tropics, and I would think a short term increase would inhibit daytime surface temperatures, but not show much of a trend as the tropics have less warming as a region. Changes in low cloud must have very different impacts depending on latitude and the season. August 22, 2012 at 8:10 am ” to get some details of the overall concepts involved. I did look at the ref. you provided but the only thing I recall was R^2 was under 0.3 which puts the results in the realm of being indistinguishable from noise. At best, it offers less than a 30% explanation of any relationship between the two. Looking at the numbers you put forth, gut feel says they are about 1/2 to 1/3 of what they should be but I don’t have time to verify this at present. A couple of years ago I did a simple cloud cover / T estimate that provided a little better than R^2 >= 0.6 with a 1-3 month shift in data but I’m not sure where my notes are that have any of the details. While this stuff is good for gaining a common sense understanding of things and can rule out some blatant BS, one is still faced with the fact that Earth is a rotating body and that time is involved on several levels. For the moment I’ll accept your estimates as possibly being reasonable for T over oceans. docrichard, due to work loads that are starting out, I may have trouble responding quickly.